Design and create a unique artist’s journal. It can be a travel diary, photo album, sketch or notebook. Using a simple binding technique, Jean Kropper will show you effective ways to personalise your journal to suit your needs. 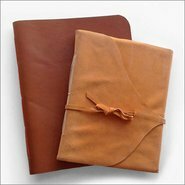 Choose a cover from the range of leather and suede provided, then build your journal using a selection of papers provided (white cartridge paper). You can bring a couple A3 sheets of your own gift wrap, coloured or patterned paper to personalise your book. Jean will guide you through the process of planning your journal, cutting the covers, folding the papers accurately, piercing sections and binding it all together. All tools and equipment supplied. Jean Kropper has worked in fine art, graphic design and in paper engineering in the USA and Australia and has taught hand bookbinding, papermaking, and 3D paper art in the USA, Canada and throughout Australia. If you would prefer to use synthetic leather for your project, let us know when booking.